It was a magical month in August, with several leopard sightings, of which I had the opportunity of seeing 3 of them, and then another one within the first week of September, which was seen by Godlisten. 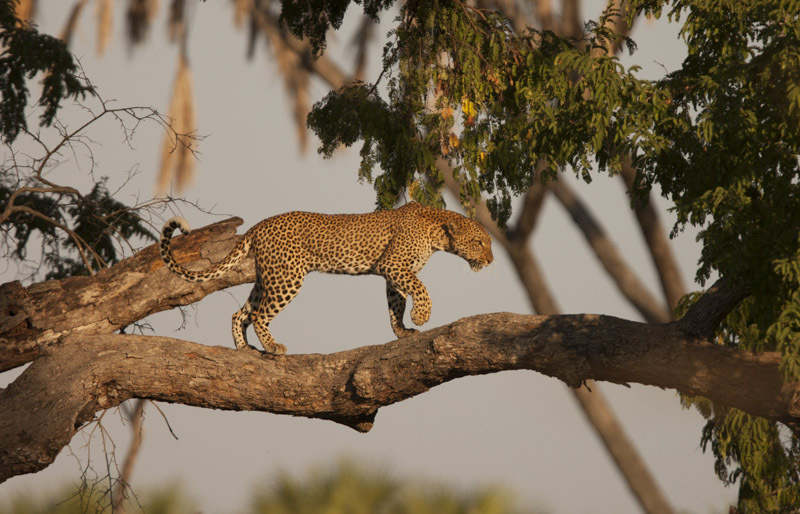 The last leopard sighting for August, we were on our way to the confluence of the Msini and Beho Beho River, to finish the evening off with some sundowners, watching the African sun setting with a gin and tonic in hand is one of those magical experiences. 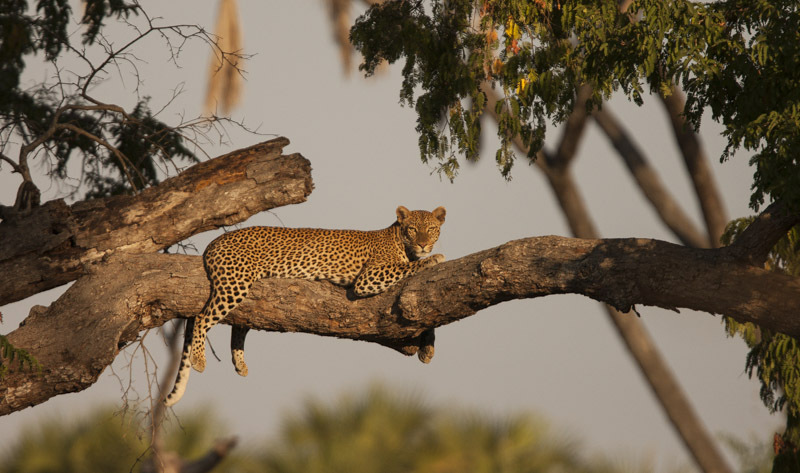 As we were about to reach the crossing, simultaneously Saning’O, Russell and myself said, “Leopard!”, and sprawled across a Tamarind trees horizontal branch, in beautiful late afternoon golden light, was a leopard resting. As relaxed as could be, she casually lifted her head to peer across at us, and then decided a nice change of position was acquired, before resting her weary eyes. Unlike other parts in Africa where relaxed leopard sightings are a common occurrence, in places like the Selous we have leopard sightings, but usually more glimpses of them as they cross a road or disappear into some brush, however it is special none the less, and almost more magical, because it isn’t something seen all the time. If we really knew how many leopards we missed, it would be depressing as their skillful camouflage allows them to blend in with their surroundings so well. A typical disruptive pelage made of rosette spots, which break up the contour of its body, making it difficult to see. As our eyes are conditioned to look for familiar outlines, when they are disrupted with stripes or spots, it takes one’s eyes time to readjust and see the animal we are looking at. Similar to looking at those 3D cards, where you need to stare at one point and slowly move it away from you, till you see the image. This female was very relaxed and allowed for some great viewing, we even went around the corner to pour some much needed sundowners, and returned to still find her resting on the exact same branch. Sipping at our drinks, after some time she decided to slip down the tree and into the brush below, to begin her early evening prowls. Besides sightings of these spotted cats, we re-sighted the Madagascar or Humblot’s Heron that was seen last season at Lake Tagalala. After disappearing towards the end of last season, we had our first sighting this season again. This for the birding community is a very big discovery as it is the only individual recorded on the African continent, and all sightings have been in the Selous. This species of heron inhabits Madagascar which is the only place it breeds, but there have been sightings of it in the Comoro Islands and Mayotte. These birds have been described as having tendencies to go on long distance searches for adequate habitat requirements, but there is no evidence of it being a migratory species. The estimated number of Madagascar Heron is currently at 1 500 individuals, which would mean only 1000 mature individuals, thus making this an endangered species. The major threat is wetland modification and conservation for human use, cultivation of rice systems, and then egg collection and nestling harvesting for food. These birds feed mainly on medium and large fish, and require nesting trees. So a very exciting bird to see. This entry was posted in Walter, Wildlife and tagged Beho Beho, camp, leopard, madagascar heron, safari, selous, walter. Bookmark the permalink. You were blessed not only with a leopard sighting but with that magical light that appears for about 15 minutes each afternoon! Please save some sightings for me. 😉 See you in about 6 weeks! 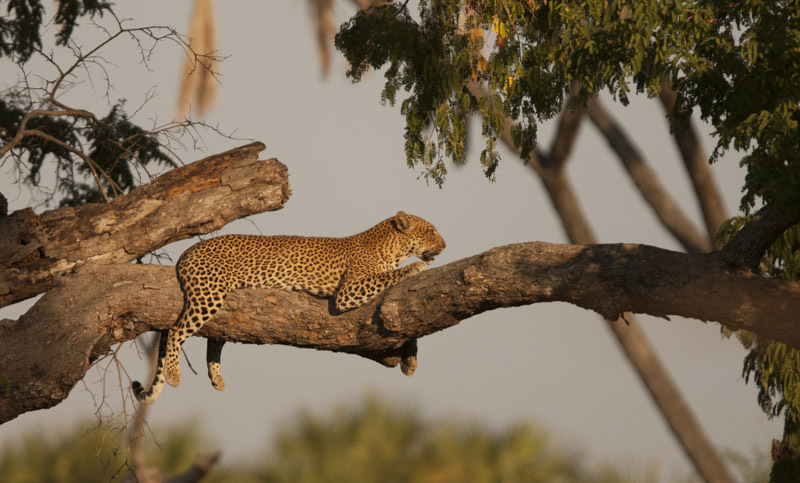 on 3 visits to Beho Beho we have seen most things but a really good leopard viewing has always eluded us. Hopefully we’ll return next July to see this beautiful animal.